This is the ultimate pop-up camping tent. Other similar tents are tricky to figure out, built with flimsy components and offering far less interior space. Our hub tent sets up and takes down in under 90 seconds. It is constructed from durable polyester and features six removable tight-weave mesh windows. Unique to the Gazelle hub tent is its removable floor, which allows you to shake out dirt and sand with ease. 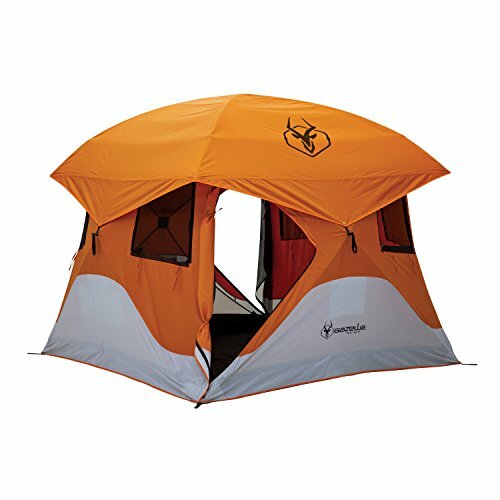 This tent is spacious, covering 61 square feet of floor space and standing 80 inch tall-sleeping four people. Included with the tent are a removable rain fly, removable gear loft, ground stakes and tie-down ropes. Whether you're camping, going to an overnight outdoor, or setting up a clubhouse for your children, nothing beats the Gazelle hub tent.